For today’s single Pinay, dating can get so complicated and take so many twists and turns, it’s hard to imagine that other women can actually meet one man, date only him for years, and end up with their happily ever after. But the stories of the six married women that follow show us that it is possible—and what do you know, they’re their husbands’ first and only loves, too. Greg, 35 made such an impact on Melissa, 35 when they first met that she instantly thought he was “The One.” They tied the knot in 2005 and have a daughter together. Melissa: “Greg and I met at a football game in 2001, when we were 18-year-old Harvard freshmen. I liked him immediately—he actually laughed at my terrible jokes—and that night, I told my roommate I had met ‘The One.’ Indeed, I had. 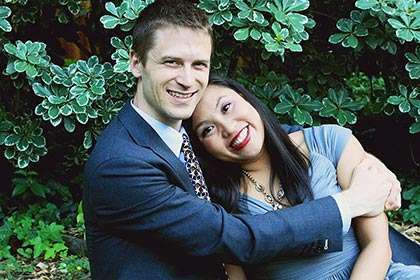 “We married in 2005, and our relationship has thrived throughout graduate school and moves to Morocco, California, and New York. Adding to the joy and excitement is our daughter, born in 2008. “Today, our lives are busy with the demands of parenthood and careers (he’s a surgeon, I’m a professor), but we’re still very much in love. “Having met and married young, Greg and I have a ‘startup marriage’: We wed before we had proven ourselves or achieved any success in the world, and our partnership carried significant risk. We’ve also sacrificed other opportunities, personal and professional, for our relationship. And while I sometimes wonder how our lives would’ve turned out if we had made different choices, I don’t feel that I’ve missed out on anything because I know that Greg is the right person for me. Our relationship is strong partly because we’ve grown up together and, in the process, grown closer together, while developing our values and pursuing our dreams together. Trisha, 28 and Daniel, 29 have known each other since Grade 3. They’ve gone from friends to lovers to spouses since then, tying the knot just a month ago. Trisha: “I first met Daniel 19 years ago, when we were Grade 3 classmates. In high school, I always acted as ‘bridge’ between him and the girls he liked, who happened to be my friends. In junior prom, he asked me to be his friendly date since we were both single. “After high school, I went to a different university and hardly saw Daniel. After my college graduation, Daniel asked me out to dinner. I agreed and we reconnected. We were both single since birth at that time, sharing our failed attempts at love and traits of our ideal partners. I had no idea that he would be my first and only boyfriend. “Daniel courted me for three years; we officially became a couple at the age of 25. We dated for two years until he proposed. 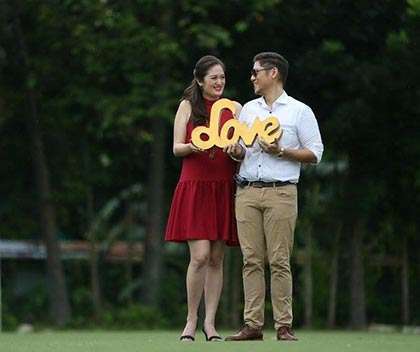 “We were both awkward from courtship until our proposal—from Daniel saying his first ‘I love you’ during a horror movie to not kneeling when he proposed. “I do not regret not having had the chance to date other guys. The beauty of being each other’s firsts is that we can’t compare each other to anyone. We were both able to build our first romantic memories together, learn together, accept each other’s mistakes, and love each other without expectations. 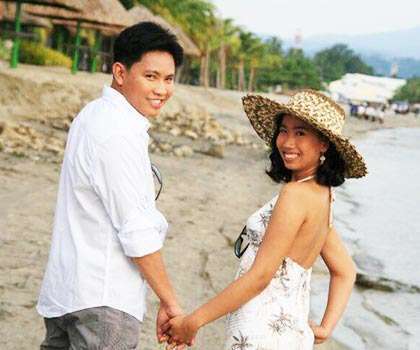 Rizel, 31 met Lawrence, 28 when, as a college freshman, she kept going back to her high school alma mater where he was in his third year. They got hitched in 2016. Rizel: “I met Lawrence in October 2004 at QueSci journalism class. He was in third year high school while I was a freshman at UP; I had been coming back to my high school to help train some students in feature writing. 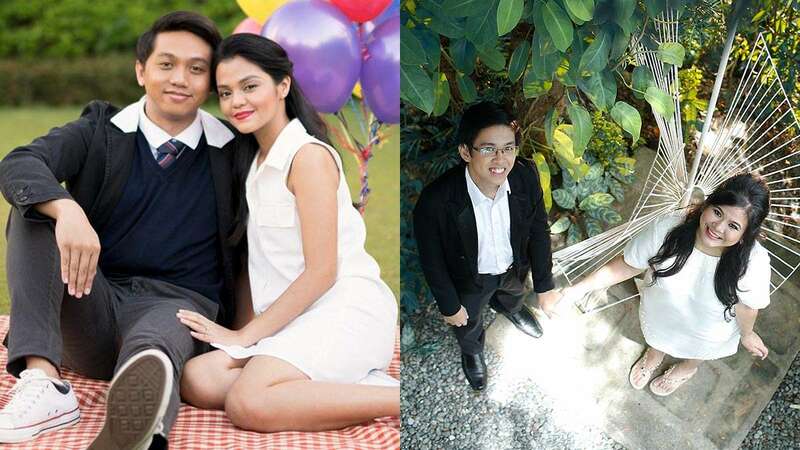 “We became good friends as he was the one who invited me to CCF Jzone, where I met Christ. After two years of friendship, naging mag-M.U.—‘mutual understanding,’ ICYDK. “He officially asked me to be his girlfriend in 2008. Why it took him so long to ask? Because one of his prayers was to have his first girlfriend be his last. So technically asking me that question was like a marriage proposal to him. “He was my first boyfriend. To some, saying ‘yes’ to being his girlfriend might have looked like I had closed my door to other options. The thing is, I was not looking for ‘options,’ nor was my intention to find love in different guys. Saying ‘yes’ to him meant falling and growing in love with just one man. Definitely not missing out on anything because even after we were married in May 2016, I still am waking up every day getting to know him more, holding his hands a bit tighter, hugging him even more frequently. Judy, 32 and Ezekiel, 36 went through many trials in their time together—from disapproving parents to a long engagement to miles spent apart. They got married in 2009 and now have two kids. Judy: “It all started during the student council elections back in high school. I had a crush on him since day one; later I learned he had a crush on me, too. “When we became a couple, I was only 16 and he was 20. He was my first boyfriend and I was his first, too. I was afraid to hide our relationship from our parents so we told them about it on our first week as a couple. “As I was still in high school then, my parents thought I was too young to be in a relationship. Afraid that my parents would tell me to break up with him, we both proved to them that we inspire each other by studying harder. My grades zoomed up and we both maintained good grades. We both graduated on time and supported each other every step of the way. “We complement each other in every way and it just seems like God had directed our paths towards each other and prepared everything for us. There were times when we almost gave up, but our love for each other as well as the guidance of our parents and our fervent prayers for our relationship made it possible to survive seven years of engagement despite the distance. Abigail, 34 and Walter, 36 met when they were both in their 30s yet still single since birth. They became husband and wife in 2017 and have just welcomed their first child. Abigail: “I met Walter four and a half years ago through a close friend of mine who felt that the two of us might click. Yes, we were both already in our 30s then, and were both yet to be in relationships! 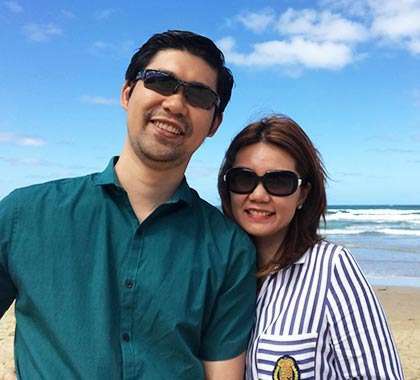 “Our relationship started through the usual text messaging and getting to know each other that later led to weekly dates and trips here and abroad. We tied the knot in February 2017, and just recently, I gave birth to our first child, a baby girl. “I have always prayed for true love to come my way and have always felt that God had his reasons for why it took a while for Him to lead him to me. It was heartwarming to know that Walter was doing the same thing, too. “I married a patient, understanding, and loving man. We both are always careful with each other’s feelings because despite our differences and minor misunderstandings, we’ve never experienced a breakup nor even shouted at each other. Shiriel, 27 and Victor, 23 were best friends—until he decided that he was serious about her. They have been married for a month now. Shiriel: “We met through a cosplay event I emceed eight years ago. We had no friends in common, but we became best friends. “What was amazing about Victor was that he was very mature for his young age. We came to a point in our friendship when I didn’t want any strings attached and I told him that it’s either he pursues me or we’ll just be best friends. We processed this separately for a month, and in the end, he made a decision to pursue me. “The thing that made him different from all the other guys was that: He never gave up. I pushed him away several times, my dad told him not to see me anymore, and yet he took courage and talked to my father! He knew whom he wanted to marry from the time he chose to pursue me. He didn’t take no for an answer. He fought and believed that we would get married. He chose to love unconditionally. “After five years of friendship, two years as boyfriend and girlfriend, and three months of engagement, I’m now happily married to my best friend who never gave up. “I did think about what I might be missing by only being with one man. Some may say that it’s no fun being with only one partner, but as I stare at him now while he’s happily cooking breakfast for us, I have no regrets at all. Having all my firsts with him has kept me fully content in our relationship.